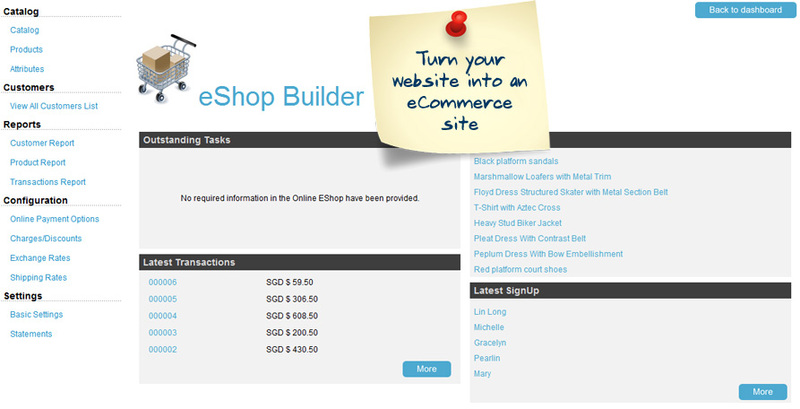 Create your online business with eShop Builder, an eCommerce platform, with no technical knowledge needed. Simple to edit with point-and-type and drag-and-drop features. Integrated with major payment gateway options and offline payment modes. eShop Builder consists of all the features and functionality of Web Builder, a content management system that enables users to build and update their websites easily. Manage site visitors, contributors, publishers and their privileges. Update catalogue, manage products, and fine-tune promotions such as discounts. Multiple billing addresses, shipping addresses – especially useful for selling gift items. *Customers will need an existing account with any one of the existing payment gateways (e.g. PayPal, RBS WorldPay or eNETS) to transact online. Generate reports and manage all submitted data. Tools are easy to use with no technical knowledge required. Improves visitor's experience by creating a consistent look and feel using web layout template. Engage your customers with a wide range of features (such as feedback, calendar, mailing list). Manage your catalogue and products. Select the plan to make a purchase. Note: Please ensure that you have an existing account in 1 of the three payment gateways (PayPal, RBS WorldPay or eNETS) before buying this application. eShop Builder is a feature- rich eCommerce platform built in with content management system (CMS) capabilities that provides online merchants with complete control over the look, content and functionality of their eCommerce store. What is the minimum system requirement to enjoy eShop Builder? eShop Builder is compatible with Internet Explorer 8 or higher; Google Chrome; Mozilla Firefox v14 or higher and Safari. What Payment Gateways are compatible with eShop Builder? eShop Builder is integrated with three (3) major payment gateway options. The options are eNets for local transactions and PayPal and RBS WorldPay for international transactions. eShop builder also offers offline payments that include cheque/money order and bank transfer. eShop builder allows you to create 5 main product categories and upload up to 100 product listings. Does eShop Builder allow me to input product attributes? Yes. eShop Builder allows you to add product attributes such as colour, sizes, weight, etc. You are limited to 20 product attributes per product. Does my customer need to register as a member before purchasing? Yes, your customer needs to register as a member first before making any purchase on your eShop. How frequent does the eShop Builder performs data file backups? (a) Daily backup – Data shall be backed up daily and stored on a backup server. Customers will be able to restore their data daily. In the event of 'accidental termination', customers would be able to retrieve their data as of the last backup, i.e. the backup on the day before. (b) Monthly backup – At the end of each month, the data on the backup server shall be archived to external storage and stored away off-site for a period of 1 year. Can I sign up for eShop Builder when I have Web Builder? Yes. You can upgrade your Web Builder to become eShop Builder. Please contact us for further assistance. What type of reports does eShop Builder provide? What if the transacted amount does not tally with the payment gateway of choice? For any transaction related issue, please check with your selected payment gateway provider. Singtel will not be able to advise on any issue relating to your transactions. Does eShop Builder come with Control Panel? Yes. eShop Builder comes with a control panel or dashboard where the user can control the settings such as the web counter, Search box and more. Are Linux hosting, FTP, PHP and Mysql supported by eShop Builder? What happens if customer terminates the eShop Builder service before the contractual period ends? To terminate the service, customer will need to inform us at least 30 days in advance. An early termination fee will be imposed and is calculated based on the number of remaining months of the contract period multiplied by the subscription rate that customer is paying for eShop Builder. Customer would need to retrieve and backup all the current data from eShop Builder before requesting for termination. The data will be removed on the termination date. Have a question about this app? Our dedicated technical team is here to help..